The Shrine to Peryite is the shrine to the Daedric Prince, Peryite. It is located northeast of Markarth, west of Karthwasten. Anyone traveling to the shrine from Markarth would be best advised to take the path to the north of Salvius Farm and to take the right fork when they near Ragnvald as there is no direct route from Karthwasten to the shrine. The shrine is relatively humble: there is an alchemy lab next to a large rock, with a long wooden table to the right and a campfire with a cooking pot hanging over it to the right of the table. On the table is a copy of the Speech skill book The Buying Game, a scroll of Heal Other and a metal pot containing a canis root, an abecean longfin, a silverside perch and filled soul gem. There is also an odd-looking golden cauldron in front of a withered tree to the south, that is wrapped in sickly green roots, with three clusters of the bleeding crown fungus along with several human and animal skulls around the trunk. The odd-looking cauldron is used in the ceremony to contact Peryite, once Kesh has created the incense from the items you collect, he then instructs you to inhale the sickly green fumes that come from the cauldron once he burns them. Kesh spends all his time either cooking or working at the alchemy lab. Kesh doesn't seem to need sleep, sit or even eat as there is no furniture or bedding and no food. 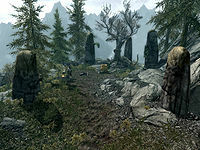 Where most Daedric Princes have a statue, Peryite has the tree, which is flanked by two large upright stones. The only worshipper of Peryite at the shrine is a Khajiit named Kesh the Clean. Kesh owns all of the items on the table and will be displeased if he sees you taking it even after completing the quest for his master. The shrine is positioned on the top of a cliff above Karthwasten; at the base of this cliff, beneath the withered tree, is an unmarked location with an interesting easter egg and some good loot. Two random poisons and a random dagger, as well as a diamond, will be at the base of some sort of ancient totem. The totem is carved with dragons at the top and looks like it was made to hold shackled prisoners, possibly for sacrificial purposes. As the symbol for Peyrite is the dragon and given its proximity to the shrine, it can be inferred that the ancient totem has something to do with the daedric prince. There is also a nearby chest which contains some leveled loot which always seems to include a copy of the Illusion skill book Incident at Necrom. There is a silver ore vein down the hill to the west-northwest and an iron ore vein near the ancient totem. This page was last modified on 28 March 2019, at 17:16.